Greensboro, NC (December 27, 2018) – January is National Mentoring Month. Continuing the tradition, the City of Greensboro and United Way of Greater Greensboro are celebrating the mentoring movement and expanding quality mentoring opportunities. Throughout the month, United Way and the City are encouraging members of the community to make a difference by becoming a mentor. United Way manages a registry of almost 30 mentoring programs that might have the perfect fit for you. One program is United Way’s African-American Male Initiative that provides mentors for our African-American, Hispanic and other male students. Mentoring starts in grades 2nd – 5th at Wiley Elementary, 6th – 8th at Jackson Middle and 9th grade at Smith High School. Mentoring is a critical part of developing life changing relationships – mentoring is proven to have a positive effect on academic, social, and economic outcomes for our young people,” said Mayor Nancy Vaughan. Research shows mentors can play a powerful role in providing youngsters with the tools to make responsible choices, attend and excel in school, and reduce or avoid risky behavior like gang activity or drug use. Yet, the same research shows that 1 in 3 young people in our country will grow up without a mentor. National Mentoring Month each January allows for unique engagement from community members interested in becoming a mentor. This year, with the support of the mentoring community, we are encouraging the public to go beyond just digital engagement – and become involved in making a real life impact. Mentoring relationships are at their best when connections are made between a caring adult and a young person who knows that someone is there to help guide them through real life decisions. Pledge to be a mentor today, by contacting the United Way of Greater Greensboro. A day of international conversations on social media where photos, video and messages to share powerful mentoring stories. A day to share in the inspirational words of MLK, Jr., and elevate the spirit of service through volunteerism. Join GSO mentors and mentees at the Day of Service at Four Seasons Town Centre brought to you by The Volunteer Center of Greensboro. Visit https://www.unitedwaygso.org/event/martin-luther-king-jr-day-of-service/ or click here for more information. This day concludes the #ThankYourMentorcampaign! Check out United Way’s social media for local thank yous including the hashtags #MentorIRL, #MentoringMonth and #MentorGSO. To learn more about the role mentoring plays in our community and to find volunteer opportunities, please visit www.unitedwaygso.org/mentoring-matters or contact Traci McLemore at traci.mclemore@unitedwaygso.org. National Mentoring Month is led by MENTOR: The National Mentoring Partnership and the Harvard T.H. Chan School of Public Health, with support from the Highland Street Foundation. Each year since its launch in 2002, National Mentoring Month has enjoyed the strong support of the President and the United States Congress. Other prominent individuals who have participated in the campaign include: Maya Angelou, former President Bill Clinton, Clint Eastwood, Quincy Jones, Cal Ripken Jr., Bill Russell and Usher. School’s out and over 100 kids are attending a summer camp for free thanks to generous supporters like you who donated to United Way’s Best Summer Ever. We’ve once again partnered with The Boys & Girls Club, YMCA and Proehlific Park to provide kids with a meaningful summer camp experience that will help them return to the classroom better equipped to stay on track and succeed. Research shows keeping kids engaged in learning over the summer months is critical to academic success. Programming offered at these camps will not only keep kids engaged in learning but will also provide mentoring to encourage character growth. Proehlific Park, operated by former NFL star Ricky Proehl, offers summer camp slots through the P.O.W.E.R. of Play Foundation. The foundation teaches the core values of Play, Opportunity, Work, Excellence and Respect (P.O.W.E.R). Julia Eger, the foundation’s executive director says they are always excited to partner with United Way’s Best Summer Ever. “I’ve heard stories about kids who end up staying home over the summer, some who have stayed home alone while their parents work. It’s not hard to image how this can lead to a lot problems,” says Julia. Julian attended Prolific Park’s summer camp last year. Above he checks out the room at United Way’s Speaker Series while his mother tells the crowd when he got off the camp bus last year he had the biggest smile she’d ever seen. According to Julia, United Way’s partnership is helping reach local families who haven’t heard about the park or foundation. In response to the April 15, 2018 tornado that affected our neighbors, we will continue to collaborate with official disaster response representatives. As updated information is available, we are committed to passing it along as soon as possible. Mt. Olivet AME Zion Church2123 McConnell Rd. Genesis Baptist Church2182 E. Bessemer Ave.
New Light Missionary Baptist Church1105 Willow Rd. Salvation Army Food Pantry1311 S. Eugene St.
Greensboro Urban Ministry Food Pantry305 W. Gate City Blvd. St. Mary’s Catholic Church812 Duke St.
With the coordinated support of the City of Greensboro and Guilford County, United Way of Greater Greensboro is accepting monetary donations to support local organizations working directly with children, families and adults impacted by the tornado. Local organizations receiving funding will be selected by the City of Greensboro and Guilford County Disaster Response Committee. Donations can be made online securely through United Way www.UnitedWayGSO.org. Donations can be mailed to, or dropped off at, United Way of Greater Greensboro, 1500 Yanceyville St., Greensboro, NC 27405. Checks should indicate the donation is for “Tornado Relief.” Office hours are 8:30 a.m. to 5 p.m. Monday – Friday. Contact The Volunteer Center of Greensboro at: www.VolunteerGSO.org. Nakia Barham is the newest Community Impact and Investment intern. She is currently at senior at the University of North Carolina at Greensboro as a Human Development and Family Studies major with a minor in Sociology. Nakia has always had an interest in the development from birth to adulthood. United Way of Greater Greensboro: What’s the focus of your internship? Nakia Barham: The purpose of my internship is to assist with the management and evaluation of the UWGG Strategic Partner investment process. I actively serve on the Health & Basic Needs Council and the Education Income Council review teams. To prepare for the current 2018-2020 funding cycle, I process application materials including the materials for volunteer review. I will also help to plan and prepare for 2019-2021 funding cycle. UW: What‘s got you most excited about this internship? NB: The idea of learning something new excited me the most about this internship. I have never worked for a non-profit organization before, nor have I ever worked with grants management. I enjoy learning about the functionality of big organizations and this internship gives me an inside look at exactly how the many departments intertwine creating an awesome team! UW: At the end of your internship, what do you hope to have accomplished? NB: I hope to gain an in depth understanding of how grants management works, how funding process are done, and how UWGG effects the community. I would love to build a support network with the many individuals, of all different backgrounds, who are a part of the UWGG team! UW: What was your first impression of United Way? NB: Before interning with United Way I was completely unaware of what the organization did. I also did not know that United Way was a non-profit organization. Starting my internship here, I met some of the most interesting and intellectual people. Everyone in the UWGG office is extremely welcoming and immediately accepted me into the United Way family! In just a few weeks here, I have learned so much about the company and what happens behind the scenes of their large community impact. UW: What does service mean to you? NB: To me, service means assisting in any way to have a successful outcome. It means helping others in ways that best meet their needs. Service is not meant for what you get in return, instead it’s what you can do within your power to give someone else what they don’t have. Service is all encompassing and there is always someone or something that can gain power by your service. UW: Who is your biggest role model and how have they shaped the person you are and/or becoming? NB: My grandmother, Debra Barham, is my biggest role model and my greatest inspiration. She has instilled much needed knowledge and resilience in me from a very young age. Her accomplishments in life are motivation for me to never stop learning and growing as a person. She taught me to use every situation and opportunity, no matter the outcome, as a learning lesson. I hope to one day make her as proud of me as I have always been of her! I am blessed and grateful to have such an amazing role model to help mold me into whom I was meant to be at my highest potential. Two years ago this month Carla Banks became the Communications and Marketing Director for the City of Greensboro. With a heart for community, she began looking for opportunities to volunteer. She was involved with United Ways in other states and communities, and sought out United Way of Greater Greensboro. Carla was pleasantly surprised to see that her new United Way had a single focus: eradicating poverty. She jumped in head first and started serving on two United Way cabinets: African American Leadership and Women United. Both of which have brought her closer to her new community. “I think it is important for people to recognize opportunities that are available like African American Leadership and Women United because they specialize in areas where you feel like you can make a difference.” These cabinets, Carla explained, host events that are geared toward putting the spotlight on the issue of ending poverty and illuminate ways that the issue can be combatted. Carla Banks Emceed United Way’s 2017 Handbags for Hope. Carla envisions a community where people are actively working together to reduce poverty and celebrate the positive outcomes along the way. Thanks to volunteers like Carla, United Way is working on making that vision a reality. Greensboro, NC (March 16, 2018) – United Way of Greater Greensboro is welcoming the inspirational subject of The Blind Side and New York Times best-selling author, Leigh Anne Tuohy, as this year’s keynote for the 2018 Community Speaker Series at the Grandover Resort and Conference Center on May 21, 11:30 a.m. to 1 p.m. The media is invited to attend. Leigh Anne and her family legally adopted a teenage homeless foster child. They raised and educated him and encouraged his passion for football. He later became the NFL Super Bowl Champion, Michael Oher. Her personal journey was later documented in Michael Lewis’ New York Times best-selling 2006 story The Blind Side: Evolution of a Game, which follows Oher from his impoverished hopeless beginnings to how Leigh Anne and her husband, Sean, adopted him to reach football success. In 2009, the book was adapted into the film, The Blind Side in which Sandra Bullock portrayed Leigh Anne in an Academy Award winning role. At United Way’s event, Leigh Anne will share her personal “Blind Side” observations, from seeing Michael for the first time to how the experience changed her as a person and the Tuohy’s as a family. She will also share the importance of recognizing the full potential of individuals in our community and inspiring us to recognize value in others. The Tuohy’s continue to make an impact nationwide with the establishment of their charity, The Making It Happen Foundation, which promotes awareness, provides hope, and improves standards of living for all the children fighting to survive in the invisible cracks of society. In 2010, she was awarded an honorary doctorate from Christian Brothers University and is a member on the Board of Directors for Taco Bell Foundation for Teens, an organization dedicated to supporting teens on their path to graduate from high school and prepare them for a successful future. United Way of Greater Greensboro’s Community Speaker Series convenes people from across our community to learn together, connect with one another, and be inspired while supporting the work of United Way. United Way’s Women United is hosting this year’s event and VF Corporation is this year’s presenting sponsor. Tickets are on sale and can be purchased at www.UnitedWayGSO.org/SpeakerSeries. Greensboro, NC (February 27, 2018) – Six local United Way of Greater Greensboro partners were honored with Spirit of North Carolina Awards at United Way of North Carolina’s annual award luncheon on February 21. Cone Health was additionally honored with an Excellence in Community Spirit Award. Each year, the United Way of North Carolina (UWNC) recognizes and awards companies and organizations that demonstrate strong community support through local United Way involvement. The Spirit of North Carolina Award celebrates the partnership of people working together to develop and implement innovative solutions for long-term community change. “We are so grateful to this year’s winners for being collaborative, hands-on partnership and corporate supporters. This year’s winners led the way with campaigns that communicated the important message of our work while creating a spirit of healthy competition and engagement” says Nadine Malpass, Senior Vice President, Resource Development, United Way of Greater Greensboro. UWNC also honored Cone Health with an Excellence in Community Spirit Award, which is not awarded every year, for far exceeding its Spirit of North Carolina Award standards of excellence. Cone Health stood out from other award winners not only because of their number of volunteer hours and financial donations, but the number of lives they impacted in the three NC counties they serve. Skip Hislop, Vice President, Oncology Services and chair of the Cone Health United Way Campaign, accepted the award on behalf of all Cone Health employees. “Our employees give of their hearts every day and the work of the United Way is an extension of that. It is easy for us to support an organization that shares our values and commitment to the communities we serve,” says Hislop. “Cone Health Network is an excellent example of people who care about all aspects of humanity and doing good for others,” says Michelle Gethers-Clark, United Way of Greater Greensboro president and CEO. Winners were determined by a panel of 20 judges from United Way organizations across the state. For more information about the Spirit of North Carolina Award and a complete list of winners, visit unitedwaync.org/spirit-north-carolina-award-winners. Kacie Lynch is our newest Marketing and Communications intern. She is currently a senior at Elon University as a Human Service Studies major with a minor in Criminal Justice Studies and Sociology. Kacie gained interest in interning with us after Michael Cottingham, our VP of Marketing and Communications, was invited to sit on a panel at Elon to discuss communications as a profession. 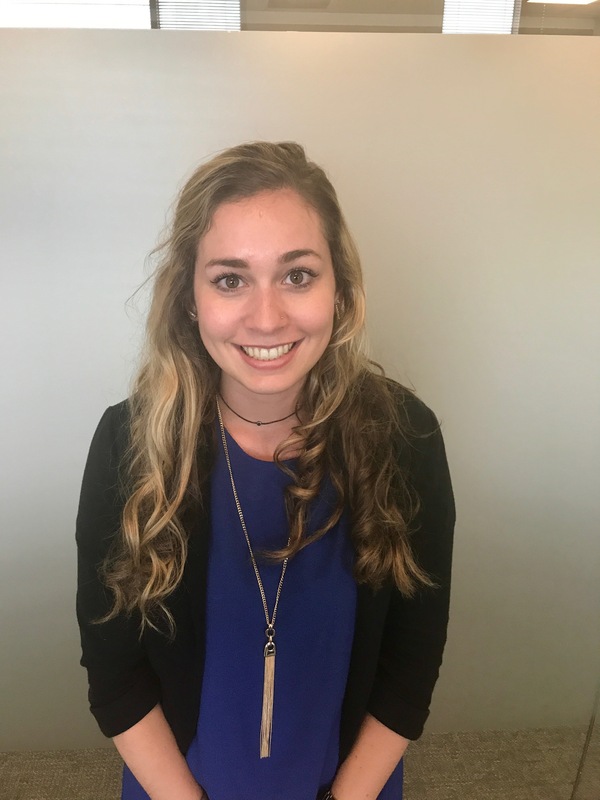 Kacie Lynch: The focus of my internship, I believe, is to interview United Way donors, program participants, and program employees and create profiles and stories based on each individual’s unique experience. UW: What has got you most excited about this internship? KL: I am most excited about hearing each individual’s personal story and to convey these experiences into stories. KL: I hope to have gained a comprehensive understanding of non-profits and to have created content that can be utilized to increase campaign funding. KL: My first impression of United Way was that all of the people who worked in the GSO were incredibly driven. I immediately wanted to be a part of this organization, in particular, because of the passion that I saw in employees. KL: I believe anyone can partake in community service, but that it takes special individuals to actually be engaged and connected with what they are doing. In order to engage and connect with community service, I think that you have to find something resonates within you. You have to find something that compels you, that drives you, that you relate to. KL: My biggest role model is my dad as he has always encouraged me to find something that I am passionate about and pursue that. During my first semester of college, my dad emailed me a photo. It said, “Working hard for something we don’t care about is called STRESS. Working hard for something we love is called PASSION”. These words have guided my decisions and have pushed me to discover what I am passionate about, which is helping others and connecting them to resources. Had my dad not sent me these words my first week of college, I might have settled for something I was mildly interested in, as opposed to something that excites me and that drives me to make the world a better place. United Way of Greater Greensboro knows the importance of a family’s financial health and has teamed up with BB&T Bank to host its fourth annual Family Economic Success Day, Tuesday, February 28, 9:30 a.m. to 5 p.m. at a new location this year – Guilford Child Development, 1200 Arlington St, Greensboro, NC 27406. Family Economic Success Day offers free state and federal income tax preparation and filing by IRS-certified volunteers, workshops on financial topics, and BB&T will utilize their mobile Bank Bus to provide free credit reports and reviews to those who qualify for tax prep. People whose households earned $54,000 or less in 2016. Contact Zandra Cuff at United Way at Zandra.Cuff@unitedwaygso.org or 336-378-5029. To receive free tax preparation services, people must bring a photo ID for themselves and spouse (if applicable), all W2s and tax documents, and actual social security cards or proof of ITIN numbers for every person in the household. A copy of last year’s tax return will save a lot of time. “Many people don’t know that they can get their both state and federal taxes done for free through VITA. People living on a low or moderate income could really use that few hundred dollars out of their refund instead of paying for tax prep,” says Sarah Glover, Community Impact Manager, United Way of Greater Greensboro. “BB&T’s CRA Department is committed to enriching our neighborhoods through community development, leadership and innovation. Dedicating our Bank Bus as a mobile VITA site is an innovative approach that brings money-saving services directly to our neighbors in need. We are proud to partner with the United Way and Guilford Child Development to provide this service to the community”, John Stokes, VP / Community Development Specialist. For people who cannot attend Family Economic Success Day, United Way also coordinate additional free income tax preparation across Greensboro at times and locations. Taxpayers can call 2-1-1 to find a site near them. Additionally, for people who want to prepare their own taxes, MyFreeTaxes.com is available to those whose households earned up to $64,000. Family Economic Success Day is made possible by United Way of Greater Greensboro, BB&T Bank, Guilford Child Development, the IRS VITA (Volunteer Income Tax Assistance) program, Senior Resources of Guilford, and local VITA volunteers.